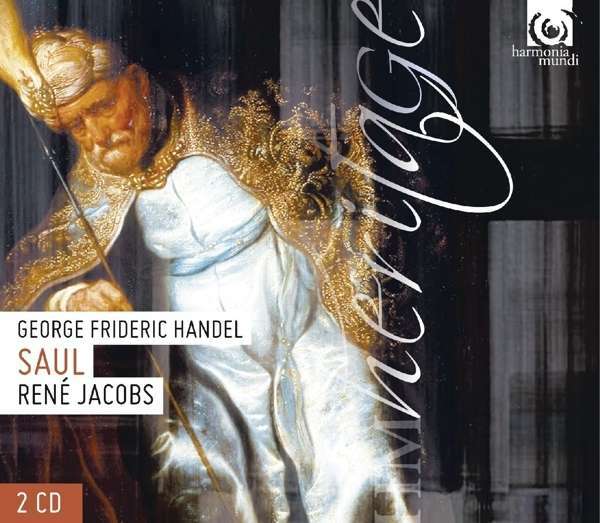 Der Artikel Georg Friedrich Händel (1685-1759): Saul wurde in den Warenkorb gelegt. FonoForum 11 / 05: "Unter der Stabführung von Rene Jacobs entwickelt das mit 40 Instrumentalisten üppig besetzte Concerto Köln einen teilweise sinfonischen Sound und verleiht der Musik eine fast szenische Plastizität. Das mehrkanalige Klangbild liefert mit seiner äußerst breiten und räumlichen Abbildung des musikalischen Geschehen den perfekten Rahmen." Stereo 11 / 05: "Jede Stimmung, jede Phrasierung, jede Klangfarbe und jede Wendung Händels: Concerto Köln trifft sie perfekt!" Hörprobe Track 6: 9. Air (David): O King, Your Favours With Delight - 10. Recitative (Jonathan): Oh Early Piety! 9. Air (David): O King, Your Favours With Delight - 10. Recitative (Jonathan): Oh Early Piety! Hörprobe Track 8: 13. Air (Jonathan): Birth And Fortune I Despise! 13. Air (Jonathan): Birth And Fortune I Despise! Hörprobe Track 11: 20. Symphony: Andante Allegro - 21. Recitative (Michal): Already See The Daughters Of The Land - 22. Chorus: Welcome, Welcome, Mighty King! 20. Symphony: Andante Allegro - 21. Recitative (Michal): Already See The Daughters Of The Land - 22. Chorus: Welcome, Welcome, Mighty King! Hörprobe Track 17: 35. Air (Saul): A Serpent, In My Bosom Warmed - 36. Recitative (Saul): Has He Escaped My Rage? 35. Air (Saul): A Serpent, In My Bosom Warmed - 36. 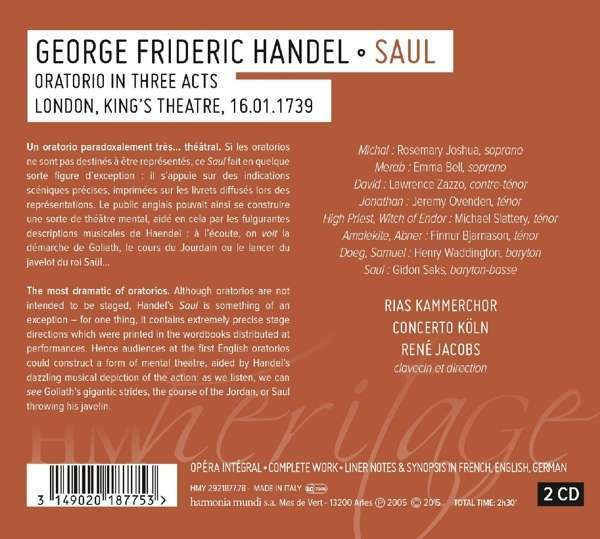 Recitative (Saul): Has He Escaped My Rage? Hörprobe Track 19: 38. Accompagnato (Jonathan): O Filial Piety! - 39. Air (Jonathan): No, Cruel Father, No! 38. Accompagnato (Jonathan): O Filial Piety! - 39. Air (Jonathan): No, Cruel Father, No! Hörprobe Track 21: 42. Chorus: Envy! Eldest Born Of Hell! 42. Chorus: Envy! Eldest Born Of Hell! Hörprobe Track 3: 52. Recitative (Jonathan, Saul): Appear, My Friend - 53. Air (David): Your Words, O King, My Loyal Heart - 54. Recitative (Saul): Yes, He Shall Wed My Daughter! 52. Recitative (Jonathan, Saul): Appear, My Friend - 53. Air (David): Your Words, O King, My Loyal Heart - 54. Recitative (Saul): Yes, He Shall Wed My Daughter! Hörprobe Track 10: 66. Accompagnato (Saul): The Time At Length Is Come - 67. Recitative (Saul, Jonathan): Where Is The Son Of Jesse? 66. Accompagnato (Saul): The Time At Length Is Come - 67. Recitative (Saul, Jonathan): Where Is The Son Of Jesse? Hörprobe Track 16: 75. Recitative (David, Amalekite): Whence Comest Thou? - 76. Air (David): Impious Wretch, Of Race Accurst! 75. Recitative (David, Amalekite): Whence Comest Thou? - 76. Air (David): Impious Wretch, Of Race Accurst! Hörprobe Track 22: 83. Air (Michal): In Sweetest Harmony They Lived! - 84. Solo (David And Chorus): O Fatal Day! - 85. Recitative (Abner): Ye Men Of Judah, Weep No More! 83. Air (Michal): In Sweetest Harmony They Lived! - 84. Solo (David And Chorus): O Fatal Day! - 85. Recitative (Abner): Ye Men Of Judah, Weep No More!